PublicAffairs. Used - Good. Shows some signs of wear, and may have some markings on the inside. PublicAffairs. Used - Very Good. Great condition for a used book! Minimal wear. 100% Money Back Guarantee. Shipped to over one million happy customers. Your purchase benefits world literacy! PublicAffairs. Used - Very Good. Ships from Reno, NV. Former Library book. Great condition for a used book! Minimal wear. 100% Money Back Guarantee. Shipped to over one million happy customers. Your purchase benefits world literacy! PublicAffairs. Hardcover. GOOD. Spine creases, wear to binding and pages from reading. May contain limited notes, underlining or highlighting that does affect the text. Possible ex library copy, thatâll have the markings and stickers associated from the library. Accessories such as CD, codes, toys, may not be included. PublicAffairs, 2008. Hardcover. Very Good. Disclaimer:A copy that has been read, but remains in excellent condition. Pages are intact and are not marred by notes or highlighting, but may contain a neat previous owner name. The spine remains undamaged. At ThriftBooks, our motto is: Read More, Spend Less.Dust jacket quality is not guaranteed. PublicAffairs, 2008. Hardcover. Good. Disclaimer:A copy that has been read, but remains in clean condition. All pages are intact, and the cover is intact. The spine may show signs of wear. Pages can include limited notes and highlighting, and the copy can include previous owner inscriptions. An ex-library book and may have standard library stamps and/or stickers. At ThriftBooks, our motto is: Read More, Spend Less.Dust jacket quality is not guaranteed. PublicAffairs, 2008-09-09. Hardcover. Very Good/Very Good. VG/VG, Mild wear to Dust Jacket. Pages clean with tight binding. Owners Name on inside cover. BBS, 2008. Ex-librry copy with no library pocket. Few library marks in book. world hist.. Ex-Library. 1st Printing... Hardcover. Good/Very Good. BBS, 2008. Ex-library copy no library pocket. Dealer stamp on front endpaper. world hist.. First Printing... Hardcover. Ver Good +/Very Good. PublicAffairs. Used - Very Good. Very Good condition. Very Good dust jacket. 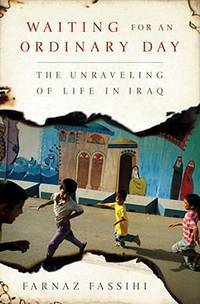 Public Affairs, 2008. normal wear clean book--------the unraveling of life in Iraq. Hard Cover. Very Good/Very Good. 8vo - over 7¾" - 9¾" tall. PublicAffairs. Hardcover. 1586484753 Brand new. Any book may show light shelf wear from warehouse storage and handling. . New. New York: Public Affairs, 2008 As new but with as new dustjacket, never read. 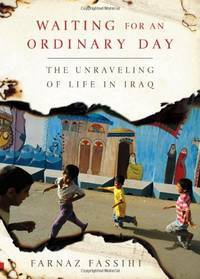 A gripping portrait of the Iragi people torn apart by war both from outside sources and civil war.. 1st Edition. Hard Cover. As New/As New. 8vo - over 7¾" - 9¾" tall. PublicAffairs, 2008-09-09. First Edition (1 in number line). Hardcover. Used:Good. PublicAffairs. Hardcover. 1586484753 Like New Condition. . Fine.